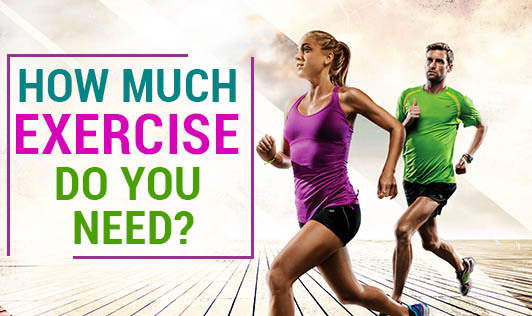 Before you decide how much exercise you need, try to figure out the reason for you to be exercising. Is it for a weight loss or to control your blood sugar levels or for staying fit? Once you decide your exercise goals it would be easier to decide on the amount and kind of exercise required to achieve that goal. A routine brisk walk would be enough for general health. But if you have a more specific goal say, to lower your blood sugar levels or blood pressure or to improve your cardiovascular health, you would require more exercise on an average, high intensity training in particular. Aerobics and muscle-strengthening exercises are two types of physical activities which are a must, regardless of the goal. The large muscles that are repeatedly used for temporarily increasing the heart rate and respiration are usually engaged in aerobics which include running, swimming, brisk walking, and cycling. Resistance bands, weight-lifting, and pushups, fall under the category of muscle strengthening exercises that involve working off one specific target muscle or a group of muscles. Therefore, for adults looking to gain muscle strength, 150 minutes/week of moderate-intensity exercises in addition to a few muscle strengthening exercises would be appropriate. For losing weight, 75 minutes of more intense exercises/week would be enough. And, lastly, for those who require exercise merely to stay fit and active, a 30 to 60-minute exercise session along with a well-balanced diet will suffice.